We had spent the day with our friend Guillermo, he had invited us over to his house for lunch and then afterwards he turned into an impromptu tour guide. We were headed to the ritzy neighbourhood of El Prado. As we walked, we past this enormous structure, Guillermo urge us to stop and listen to the history of the building. It was called the Maria Reina Metropolitan Cathedral of Barranquilla. Although large it was a fairly unimpressive building. We were told that the outer view of cathedral was much more impressive at night as the huge black diamonds on the front of the building were lit up with colored lights. 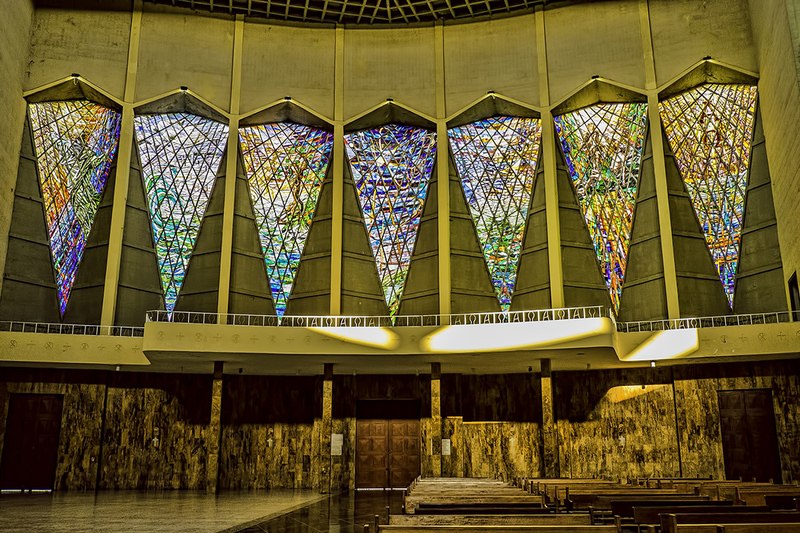 It turns out the Maria Reina Metropolitan Cathedral (Officially called Metropolitan Cathedral Mary Queen of Barranquilla) is a catholic church dedicated to the Blessed Virgin Mary Queen and took 27 years to build. Now the building is big but I didn’t realize how big. It is an area of 46000 sq/ft, 302 feet long, 125 feet at the widest and 125 feet high at the highest point. The cathedral has a bell-shaped floor that can accommodate 4,000 people seated. When we arrived we had a few minutes to kill before the church opened for the afternoon. So we wandered around The Plaza de la Paz. It is a public open space originally built in 1986, to accommodate the crowd on July 7, 1986 to receive Pope John Paul II during his visit to Barranquilla. ..incredible stained glass windows that we had not noticed on the outside because they looked black, part of the architectural design. I didn’t even think the building had any windows. Each of the 8 stunning side windows is 80 feet high and 20 feet wide. They each have an incredible 1,198 panels of stained glass. The sculpture at the front of the cathedral was unlike any Christ sculpture I have ever seen. 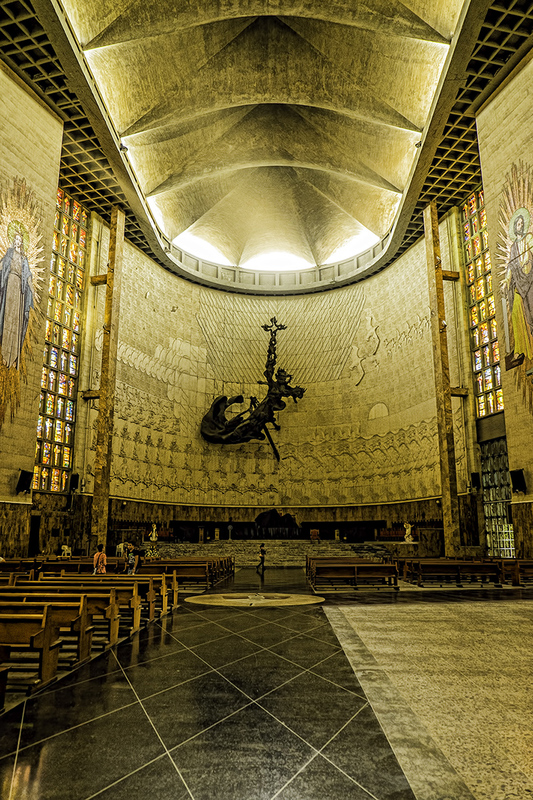 Called Christ the Liberator of Latin America, it is made of bronze, weighs 16 tons, and is 52 feet high and 23 feet wide. The 7 black diamonds that we saw on the front of the cathedral actually are 7 stained glass windows depicting the 7 days of creation.